Northwestern British Columbia has no big names, but some very big mountains. No fancy resort towns, but a living aboriginal culture. More bears live here than people: come and tilt the balance of the wild. Since 1981, when I graduated as a mountain guide from Munich Technical University, I have made my living accompanying other mountain lovers, young and old, weak and strong, novice or expert, in a wonderful and ever-changing environment. Climbing rock faces and frozen waterfalls; enjoying mountain meadows; leading day trips and three-week expeditions; holding basic rock and avalanche courses, as well as, instructing mountain guides and avalanche professionals. My life in the mountains continues to be varied, exciting and satisfying. This has been a passion of mine since I was 15, and my excitement is as keen as it always was. I grew up in Munich and started climbing in the Wetterstein mountains of Bavaria and Tirol. Faced with the necessity of making a living and having no stomach for an academic life-style, I turned to the old and honourable profession of mountain guiding (also eventually finishing a Master’s degree in the Liberal Arts, but that’s another story). In the 1980s, I was lucky enough to climb and guide many of the great rock and ice routes of the Alps: the north face of Lalidererspitze and the southwest face of Marmolata, the Brenva Spur on Montblanc and the northeast face of Piz Roseg. Lured to northern Canada by the promise of wilderness and ever-new vistas, I guided Denali (Mt McKinley) three times in the 1990s and spent much time in remote places like the Stikine Icecap and the Saint Elias Mountains. In the northwest region of Canada where I live, I expanded into fields where there was little local expertise available. I developed and ran avalanche safety programs for mines and roads (yes, that’s where you hang out of a helicopter and drop large bags of explosives with a burning fuse in them). On the other side of that field, I am now a Qualified Avalanche Planner consulting with industry on their avalanche safety plans. 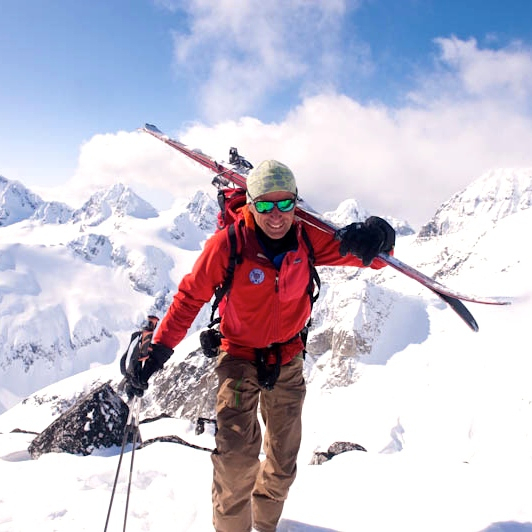 Heli-skiing, Canada’s contribution to the art of mountain guiding, filled several winters. Canada’s North is where I belong, and where I would like to bring you. In 2001, we built the spectacular Burnie Glacier Chalet in the Howson Range with wood from our forests and the help of many dedicated and skillful friends. Plus, there are many more ranges in the north, with even bigger mountains, all waiting to be explored.